Jaybird’s X2 earbuds launched around this time last year to muted praise—no glaring flaws, but not quite the premium experience a $180 price tag implies to consumers. A meaningful iteration on a popular line needs to be more than a fresh coat of paint, and Jaybird prove that with the X3. As with its predecessor, there are three tip sizes—in both rubber and foam—and three sizes of rubberized wings to provide a secure fit and a tight seal for most ears. (The foam grips better to the ear canal but doesn’t transmit sound quite as vividly, in this reviewer’s experience.) Similarly the X3 holds the same eight hour charge, is sweat-proof, and provides the same nearly flawless connectivity. Even in crowded, electronics-heavy areas that reduce many wireless headsets to an expensive pair of earplugs the X3s remained clear. In short, the best parts of the X2 is retained—so what’s changed? The most apparent improvement is to the bass. As in, there’s bass, a quality I found largely absent in the X2. Maybe it won’t satisfy the Beats-lovers of the world, but Jaybird managed to pack enough oomph into its 6mm drivers to provide a balanced sound—which can be further tweaked through its My Sound app, which saves EQ setting to the X3's firmware. After that you can close the app forever or delete it. Doesn’t matter. I tamped down the highs (which I found somewhat papery out of the box) and bumped up the mids slightly, but your sonic preferences may differ. Sadly, the app can’t disable to truly annoying voice assistant, but that’s a minor gripe. Look closer and you’ll notice the buds themselves have a flatter profile, likely to the delight of helmet-wearing sports folks, and bigger control module. A larger control module provides a single improvement (less fiddling to find the volume buttons) and two minor inconveniences. First, the X3 did away with the standard micro USB charging port in favor of a proprietary four-pin setup. Supposedly this leads to faster charging, but someone who A) is rarely away from a computer for more than eight hours, and B) has a propensity to lose things—particularly tiny, single-purpose charging docs—I foresee it being a failure point in the near future. But the chunky controls are, by virtue of their increased size, also heavier than on the X2s, and slowly but perceptibly yanked the earbud above them out from the side of my head as I walked. Try as I might, the moduled end never stayed in—until I gave those optional rubberized wings a shot. I’d chalked it up to my own bad genetics on the X2s, but the straight, soft wing design never added much security. Then again, the X2s fit like a dream without them. Non-issue. The slightly stiffer wings made for the X3s have a slight, sweeping outward curve to presses up against the folds of your ear. Looks like a minor tweak but made all the difference for me. The fit was tighter with them on, and those rubberized wings were able to bear the weight of the beefier control module. Despite launching a full $50 cheaper than last year’s version the X3 aren’t cheap. 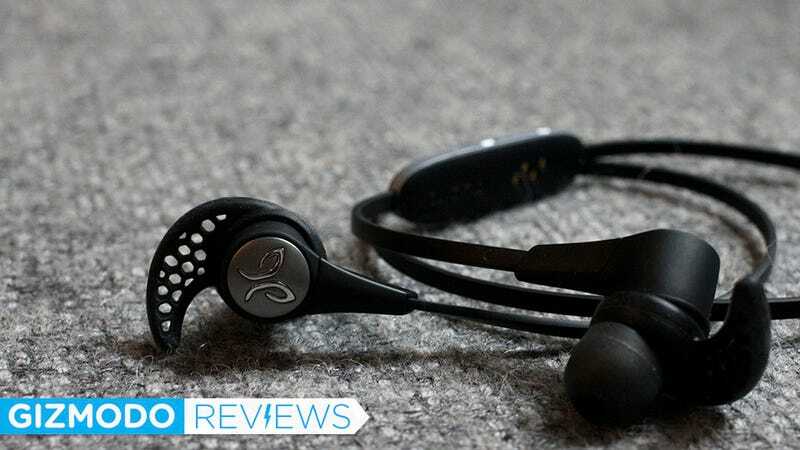 But for their comfort, better-than-average sound, and bulletproof connectivity they’re a meaningful iteration of one of the best bluetooth earbuds on the market.